* A membrane-free, air permeable, four-way stretch woven nylon/spandex fabric laminated to a low profile, mid-weight four-way stretch fleece. * Machine wash in cold water. * Wash dark colours separately. * Tumble dry on low heat. Iron on low heat. * Do not use fabric softener. Gamma MX Jacket - Mens is rated 4.6 out of 5 by 23. Rated 4 out of 5 by Justin from Buttery but able. First things first, I wore it around town as a light jacket for a few weeks where it did its duty as a light rain blocker. I was amazed at the softness of the fabric, it was so soft in fact it worried me about its robustness. My worries were unjustified. I took a trip up to Canmore/Banff and did two scrambles and a few days easy hikes. Going up Ha Ling the jacket took a few shale bites, but no cuts or frays, much more resilient than I thought. The only minuscule negative I have is with cold winds, they go through the shell easier than I had hoped. It helps keep you cool while moving fast, but when stopping for a summit tea, it really gets to your bones. A simple windshirt will take care of this, or perhaps moving up in weight to the AR. All in all, very pleased with this piece. Rated 4 out of 5 by Editor321 from Great Jacket The Gamma MX Jacket is an excellent jacket in terms of function, fit and appropriate storage. Pockets are well designed with the exception of the left sleeve pocket, some quite noticeable pilling has begun around the edges of where the pocket meets the outer shell of the jacket. This is my only beef against this jacket as it looks a little ratty for how awesome it is. If it was just an old trail jacket or hunting coat that would be different. Again, the fit is great, it stays put when working overhead and doesn't bunch up under your arms. Just the right amount of fabric went into creating this jacket and it shows. Rated 5 out of 5 by sgallo from Gammazing! This jacket is my favorite piece for climbing. I tend to get really hot climbing and can't stand any other jacket. The Gamma breathes like no other. With this being said, it still breaks wind well but by no means is it windproof (but this is not what the jacket was designed for). Through the Atom LT vest under it and together they do wonders for core warmth. The fabric is extremely tough! I have taken some bad slips on rock faces, and this jacket does not have a single thread loose! Still looks brand new. The pockets are very well placed and sized. For now I only own the sky blue, and get compliments on it daily. Bottom line, if you are looking for an active soft shell that is tough as nails, this is your answer. Rated 4 out of 5 by ADV10 from Very good but could be better Okay, awesome coat. Fit and finish are stellar; ergonomic, sleek and athletic fitting. I'm 5'8" 180 pds and wear the M very comfortably. So what's the problem? ; getting the coat on! The finish on the inside face of this soft shell is the tackiest stuff I've ever put on. It's velvety face sticks and grabs every undergarment imaginable. Every time I put this coat on its a fight to keep my shirt, top or fleece sleeve ends down at my wrists where they belong as I try to slide my arms through. Undergarment sleeves slide up and bunch up as far up as my under arms. Wow, crazy fight everytime. A simple fix to this would be to apply something like a taffeta or other laminate throughout the inner sleeves. Would be a nice touch, allow arms to slide through, add virtually zero weight, and make life much easier. Unfortunately I don't wear this coat as much as I would like for fear of the dreaded sleeve chafe. Gentlemen, please fix this. Otherwise, great coat. Rated 5 out of 5 by Ottscay from One for the Trail Living in Michigan US, I purchased the Gamma MX as a cold weather trail running jacket. My first run with the jacket was on a cold winter day (28F temps.) What really amazed me about the Gamma MX is how this garment breathes, and how well my body temperature was regulated throughout a 1 hour+ run. Under the jacket I wore a long sleeve technical shirt. I am 5'11", 180 lbs. and purchased a large, which fits my frame well. I was a little concerned about the inability to adjust the wrists, however, they stretch enough and did not "catch" cold air. 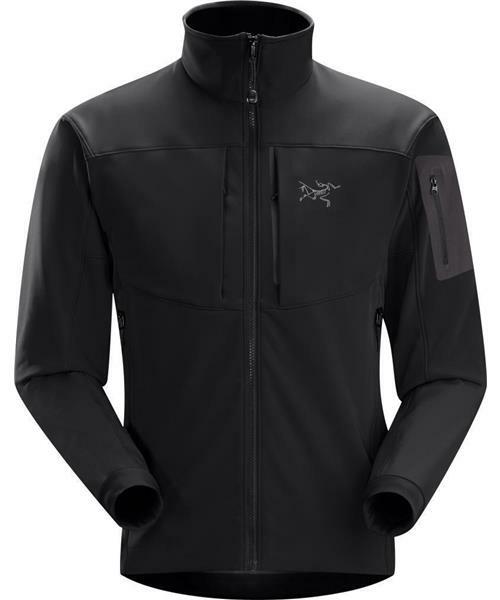 The general build and quality of the Gamma MX reflects Arcteryx's reputation for combining technology and design to output the best adventure clothing. Rated 5 out of 5 by Jpullman from 2nd Gamma MX Jacket! this is my 2nd time getting a Gamma MX Jacket - the first time i had an XL... fit great. recently i've decided to lean out - so my wife got me the L for christmas. i really like this updated version of the jacket - feels much more comfortable with the same reliability when walking around in the rain & snow. i've used the previous jacket from mild to extreme cold weather and have found the jacket to be comfortable in most situations - the only exception is when the wind is at a high level. i typically use this jacket when running errands, walking the dogs, or shoveling the driveway... really easy to use and isn't bulky. Rated 4 out of 5 by Grandy from Have owned 2 of the former polarshield models, loved them. I purchased the salsa colored jacket with the blue exterior pockets after the review in Climbing that rated this the best softshell jacket for climbing. I loved it, but then lost it. Was really bummed out and I replaced it. I have gotten terrific use from each of them, and still use the 2nd one often. I have found that for me softshell garments have a wider temperature range than fleece. I tend to change layers a lot if I overheat or get too cold, but with the Gamma MX that doesn't seem to happen as frequently. I haven't tried the most recent version with the new fabric.